This is only the tip of the iceberg, however. There are several deeper reasons CEOs should care about their online reputations. • Customers may consider a CEO’s reputation before purchasing from or endorsing a company. This is especially true if a business offers long-term services, or if the CEO supports controversial causes or policies. Moreover, a CEO’s negative personal opinion, when expressed widely, can turn loyal customers into former customers, with the fallout living forever in online search results. Sorensen cited the example of Lululemon founder Chip Wilson, who “had a veritable cult following” until he publicly said customers’ weight could be the reason his company’s yoga pants were literally coming apart at the seams after minimal wear. When word of this comment went viral, Lululemon’s stock plummeted, and Wilson was compelled to seek a new job. “No future investor or company will miss the controversy that now accompanies his name,” Forbes reported. • CEOs are the new brand ambassadors. When the public thinks Facebook, they think Mark Zuckerberg, and when they think Amazon.com, they think Jeff Bezos. These and other examples of celebrity corporate leaders show that a CEO’s personal brand can work in tandem with those of his or her corporation, according to a column in CPA Practice Advisor. • Investors are watching. Increasingly, investors are looking to companies’ online reputations, and those of their CEOs, to make decisions about where to put their money, according to a column in Inc. For companies looking to raise capital, a strong and positive CEO presence may make all the difference in these decisions. • A stellar online reputation can help establish the CEO as a thought leader and industry expert. This serves only to garner more respect for the company among customers and/or consumers, Sorensen told Forbes. 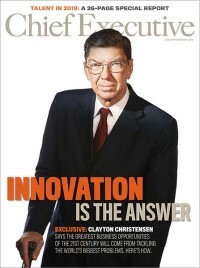 • The CEO’s reputation impacts how he or she—and the company—is portrayed in the media. A CEO’s reputation can influence what angle journalists take in their articles, and more likely than not “mean the difference between a scathing review and a positive story,” Forbes stated. The magazine cited the example of Amazon CEO Jeff Bezos, who has a reputation for being a visionary. When Bezos has an announcement, “the press listens,” Forbes reported. • Engaging in online self-monitoring. Sorensen advocated a proactive approach, via a search of the CEO’s name and photograph, as well as by setting a Google or Talkwalker alert to the existence of new posts. • Participating in social media. Many CEOs shy away from social media, but this is not a good idea because social media participation actually makes a significant difference in promoting a company’s brand. For example, according to CPA Practice Advisor, 71% of participants in a BRANDfog survey viewed companies as more trustworthy when these companies’ top executives leverage social media platforms to convey messages about their firms’ core mission, values, and purpose. • Responding properly to negative information posted online. Unfair comments, negative news articles, and other less-than-flattering online chatter can’t be removed from websites on which they are found. However, a maligned CEO can write blog posts or articles containing the same keywords to “drive these items off the first page,” CPA Practice Advisor said. Many people turn only to the first page of Google search results, which means a company can purchase ad space using pay-per-click campaigns to “push down” negative results, according to Inc. The magazine cited a study conducted by Chitka, a company that allows publishers to monetize their web traffic. It found that Google page one results garnered 92% of all traffic from the average search, with traffic decreasing by a whopping 95% for page two. No CEO will ever escape unscathed from less-than-flattering online commentary. However, the more effort expended to keep the CEO’s reputation as untarnished as possible, the better for the executive and the company alike.